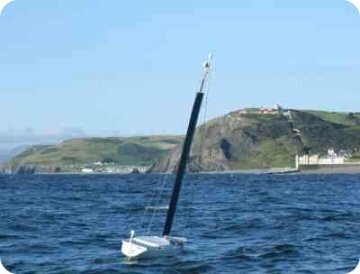 Pinta is a robotic sailboat; designed by scientists at Aberystwyth University, it will attempt the feat of sailing across the Atlantic ocean by wind power alone. This October, Pintawill join a half-dozen other contenders for a robotic sailboat race across the Atlantic. The same scientists who built the Pinta also created Beagle B, a more elaborate robot sailboat. This summer, Beagle B will demonstrate the value of robotic sail boats by undertaking a dolphin count in Cardigan Bay, West Wales. “Something that can survive for two to three months completely unassisted while doing something interesting is a major challenge. If it does get there I will be seriously cheerful. It will open up all the oceans to environmental monitoring by robots,” said Mark Neal, of Aberystwyth University. This technology (and the task) remind me of the autonomous space-going ramrobots described by Larry Niven in his 1968 story A Gift From Earth. Ramrobots had been first visitors to all the settled worlds. The interstellar ramscoop robots, with an unrestricted fuel supply culled from interstellar hydrogen, could travel between stars at speeds approaching those of light. Long ago, the UN had sent ramrobots to nearby stars to search out habitable planets. Via Times Online; thanks to Adi for passing the tip along.